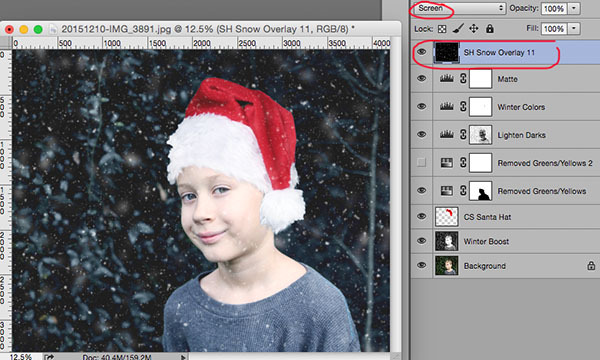 The CoffeeShop Blog: CoffeeShop "Snowy Christmas Portrait" Photoshop Tutorial and Santa Hat Overlay! 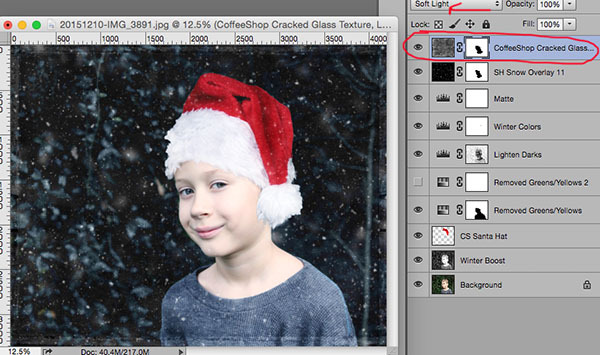 CoffeeShop "Snowy Christmas Portrait" Photoshop Tutorial and Santa Hat Overlay! Even though the temperatures the last week have been in the 70's (what winter?) 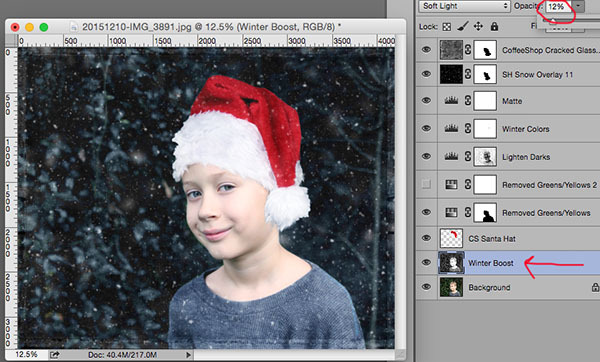 I have been having so much fun creating portraits with fake snow. 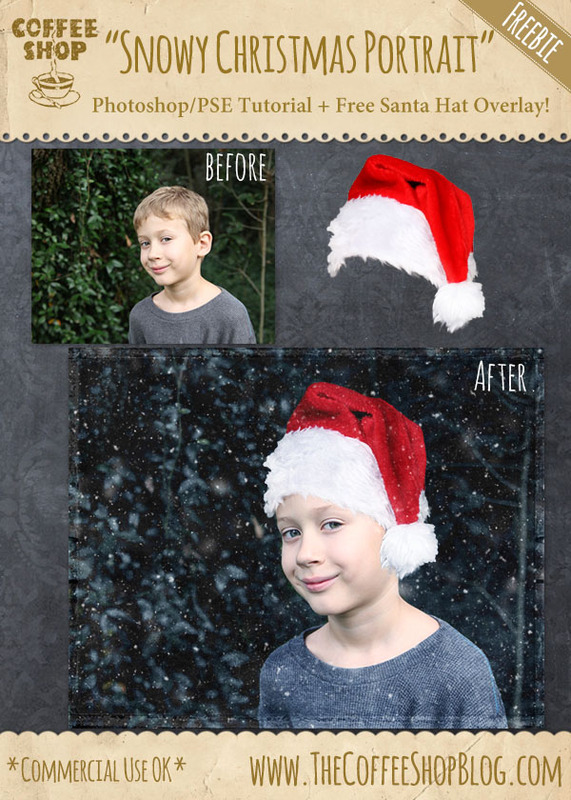 I know many of you also want to play in the "snow", so today I have a new tutorial showing you how I create a beautiful snowy Christmas portrait. 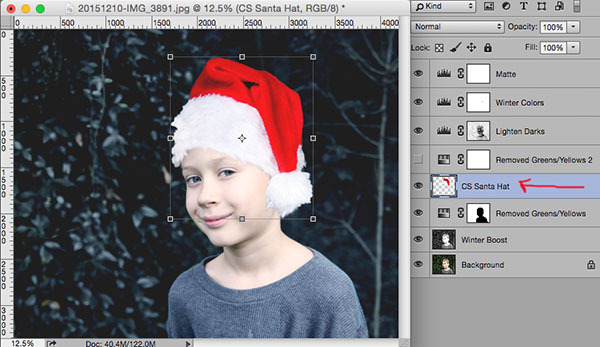 You can download the fun Santa hat I used in this tutorial at the bottom of this post. I cropped it out of this image. 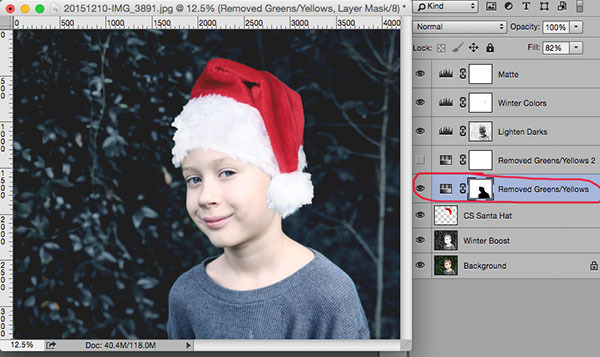 I love the refine tool in Photoshop, it made selecting this hat so easy. This is a SOOC photo I took yesterday. As you can tell, it is still green outside. 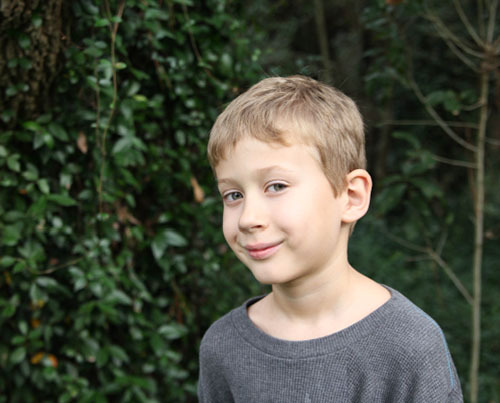 I used a little photographer trick to get his skin to glow so nicely. I ran the "Winter Dreams Extreme" action. For full instructions on using this action please visit this post. I turned on the bottom "Remove Greens/Yellows" layer, clicked to select its layer mask, and used a black brush to paint that layer off my boy. 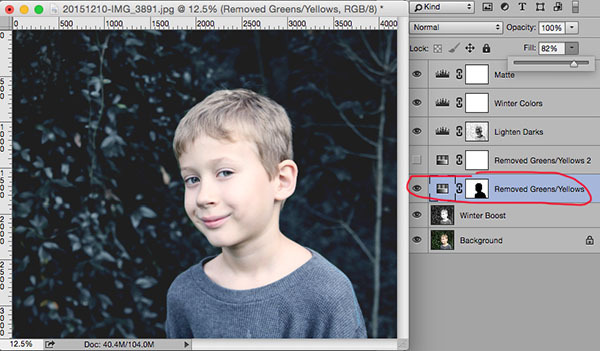 I just want to desaturate the color on the background. I also reduced the Fill of that layer to 82%. I noticed that his green eyes looked blue, so I clicked on the "Winter Colors" layer mask and used a soft black 50% brush to remove some of that effect off his eyes. 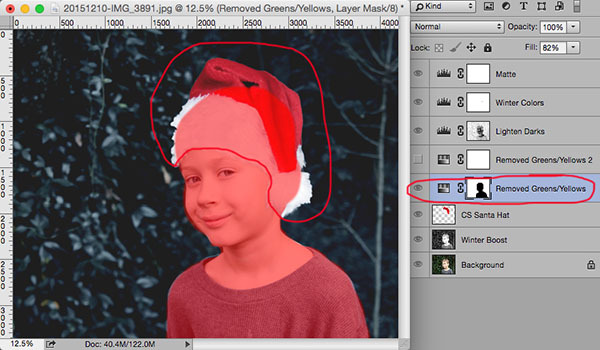 Then I added the santa hat (you can download it on the bottom of this post). I felt that the hat was too bright and colorful where I had placed it, so I dragged it under the "Remove Greens/Yellows" layer. I had painted on the layer mask to remove the "Remove Greens/Yellows" layer from his body and head, but now that I added the hat I needed to go back to the layer mask and paint that effect back on his hat. 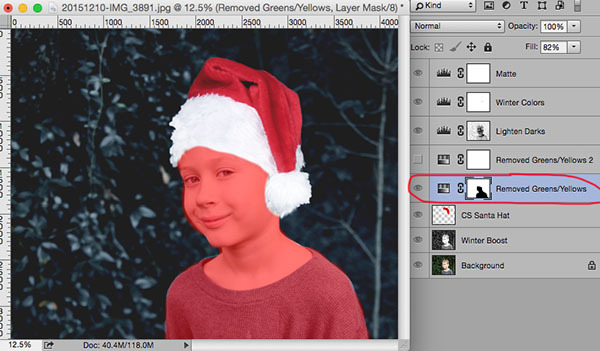 If you want to see a red color where you are painting on the layer mask as seen on my screenshot, click on the layer mask while holding Shift, Alt/Option. Repeat to remove it. I used a white soft brush to add the "Remove Greens/Yellows" effect back to the hat. Now the hat is not as bright. It is time to add the snow! I dragged the Shadowhouse Snow Overlay 11 on top of the image and put it in Screen blending mode. I added a layer mask and used a black brush to paint the snow off his face and neck. I decided to also add one of my favorite textures, Cracked Glass. 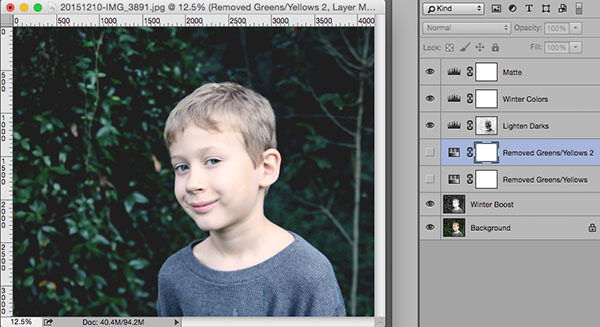 I put the texture on top in Soft Light blended mode, added a layer mask, and removed it off his face and neck. I think the image has too much contrast now, but I will fix that. 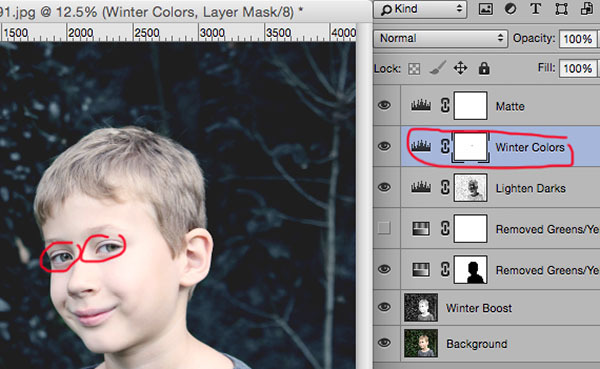 I clicked on the "Winter Boost" layer and lowered the opacity from 50% to 12%. I really love this edit now. I hope you enjoy creating your own snowy Santa images and I would love for you to share them on my Facebook page. Download the CoffeeShop Santa Hat overlay here. Thank you for the tutorial and the santa hat! I can't wait to try this out on my own. I appreciate it so much! Thanks for the tutorial and the Santa hat of course too. Also thanks for the link to the snowy OLs from Shadowhouse. I have quite a few of his textures but not these ones and since I do a lot of Christmas digi papers, these OLs will be fab. I love that set of snow overlays. They are incredible.